WordPress.com is the hosted version of the WordPress. That means you can go to WordPress.com, sign up for a free account, pick a theme, start writing, and create a live website/blog in minutes – for free. Sounds great right? Well, it is! Especially if you want to start a personal blog or have some informal ideas you want to kick around. But if you want to use WordPress to power a site or blog for any professional purposes, you are far better off heading over to WordPress.org. At WordPress.org you can download the latest version of WordPress and then upload it to a server. This means you will have a “self-hosted WordPress site.” One of the first things you’ll notice is that while WordPress itself is free, you’ll need to pay for hosting. This often only runs about $10/month for a small business site, but it also means you’ll have to decide on a hosting company. WordPress names a few here, but you can, and probably should, google “wordpress hosting” and read some reviews. Your choice of a hosting company is an important one. Most hosting companies will install the latest version of WordPress for you when you sign up. So why should you pay good money for a self-hosted WP site when WordPress.com is flashing the magic word “Free” at you? 1. You can’t use a custom theme on WordPress.com. That means you cannot customize the look and feel of your blog or site, but must use one of the premade themes. This will stop a lot of businesses in their tracks. 2. You cannot use WordPress plugins on WordPress.com. This alone is a deal breaker for me. There are two plugins that I consider essential for all WP sites/blogs: the WordPress SEO by Yoast and Google Analytics for WordPress. Google Analytics data is critical to any small business website’s success, and the SEO plugin simplifies the process of optimizing your posts. For those new to WordPress, you should know that plugins are a big deal, and one of the reasons WordPress has become so popular. They are pieces of code that extend the functionality of the core software, but the great thing for the user is that they are quick and easy to install and configure, and most are also free. There are plugins for just about every imaginable website function: contact forms, slideshows, backups, spam prevention, etc. Over time, you will be able to do a lot more with your WP site/blog, at a lot less expense, if you can use plugins. If you’ve already got a site on WordPress.com and are ready to take it up a notch, you are not doomed. WordPress offers a transfer service for a reasonable fee, or of course you could hire a developer to move the site for you. 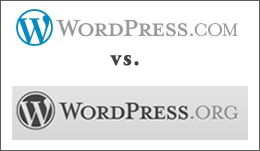 If you’d like more information about the differences between WordPress.com and WordPress.org, you can check out the official WordPress explanation. Be not simply good, be good for something.